Top off your desert inspired style with our white Sheik Headdress. This costume accessory is sure to add just the right look for your ensemble. Perfect addition to costumes for holiday shows, too. One size fits most. 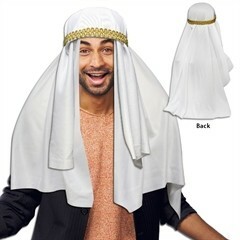 Our Sheik Headdress is priced per headdress. Please order in increments of 1 headdress.